Audacious is a cabinet with personality designed as a place for displaying your favorite things. Its special tambour doors slide around the edge of the cabinet, letting you choose how much of the interior you want to put on show. Strong and stable with a stylish kidney shape, Audacious adds organic rounded elements to the clean lines and sharp corners often found in the Nordic space. Audacious’ smooth corners soften its profile, making it easy to add to a room with even limited space. 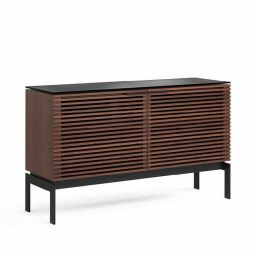 The wooden cabinet’s sliding tambour doors have a textile covering that gives Audacious a soft tactile touch. The inside shelf of Audacious is specially shaped with a cutaway section so drinks bottles or tall glasses can be easily stored when you want to use it as a bar cabinet. Alternatively, slide the doors closed and place a vase or candlestick holder on top. The flexibility and size of the cabinet means you can use Audacious in the dining room, living room, bedroom or hallway. Includes the cabinet and 2 tambour doors.